By the end of 2018, NOAA’s atmospheric observatory at Mauna Loa recorded the fourth-highest annual growth in the concentration of atmospheric carbon dioxide (CO2) in 60 years of record-keeping. Carbon dioxide levels measured at NOAA’s Mauna Loa Atmospheric Baseline Observatory averaged more than 410 parts per million in April and May, the highest monthly averages ever recorded, scientists from NOAA and Scripps Institution of Oceanography at the University of California San Diego announced today. 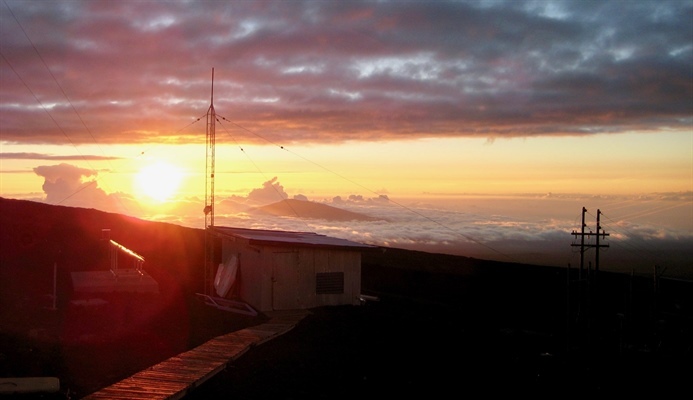 Carbon dioxide levels measured at NOAA’s Mauna Loa Baseline Atmospheric Observatory rose by 3 parts per million to 405.1 parts per million (ppm) in 2016, an increase that matched the record jump observed in 2015. Using measurements taken worldwide, scientists estimated that 2015’s global average carbon dioxide concentration was 399.4 parts per million (ppm), a new record high. At Mauna Loa Observatory in Hawai’i, where atmospheric carbon dioxide has been recorded longer than anywhere else in the world, the annual average carbon dioxide concentration was 400.8—also a new record, and a new milestone. The annual growth rate of atmospheric carbon dioxide measured at NOAA’s Mauna Loa Observatory in Hawaii jumped by 3.05 parts per million during 2015, the largest year-to-year increase in 56 years of research. The American Chemical Society designated the Keeling Curve – a long-term record of rising carbon dioxide in the planet’s atmosphere -- as a National Historic Chemical Landmark in a ceremony April 30 at NOAA’s Mauna Loa Observatory in Hawaii. Every year the Mauna Loa Obervatory contributes to the local Science Fair event. This year, Halia Buchal won the junior research award with the project titled: Purple or Green? Does Leaf Color Affect How Plants Respond to Different Colors of Light? The Senior research recipent Keanu D. Pinner won the senior division award with the project titled: Activation of the Hepatocyte Antioxidant Response by Kava Secondary Metabolites. On May 9, 2013, the daily average concentration of carbon dioxide (CO2) in the atmosphere surpassed 400 parts per million (ppm) for the first time at the Mauna Loa Observatory in Hawaii, where the modern record of observations began back in 1958. Other Northern Hemisphere sites also reported CO2 concentrations exceeding 400 ppm in 2013. By summer, the high concentrations at these sites had dropped as vegetation began taking up carbon dioxide for photosynthesis. For the first time since carbon dioxide in the atmosphere has been measured, the levels of this greenhouse gas at Mauna Loa, Hawaii, have been above 400 parts per million every single day for three straight months. Over the last five days beginning on March 16, 2014, carbon dioxide levels have surpassed 400 parts per million at NOAA's Mauna Loa Observatory in Hawaii. This is nearly two months earlier than last year when the concentration of this greenhouse gas was first recorded above 400 parts per million on May 9, at the historic NOAA observatory.